Except for the tiny sign that hangs outside the door simply reading "studio," you would never know what magic lay behind this covered up storefront building on a busy street in Williamsburg. 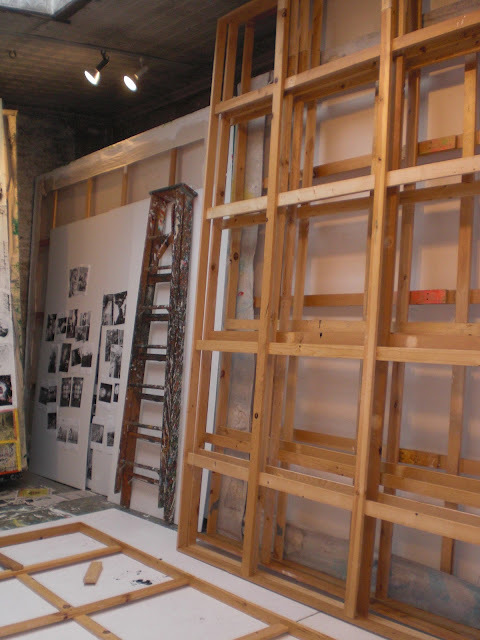 Greeted with an exuberant handshake by artist assistant Max Heiges, I was led further and further back, past walls of art books, shelves packed with sketch books, and numerous paintings, into the storefront turned studio space of Chris Martin. 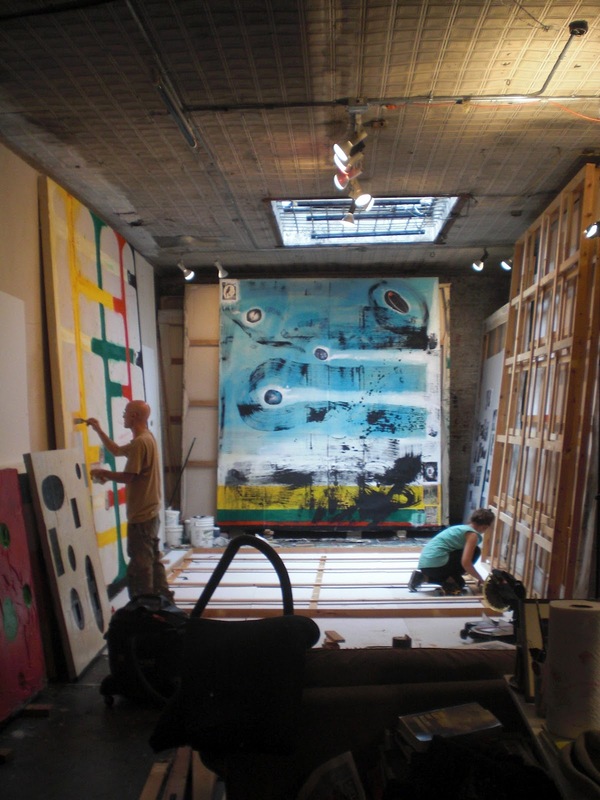 He acquired the building in 1984 after having moved his studio to Williamsburg from SoHo in 1980. 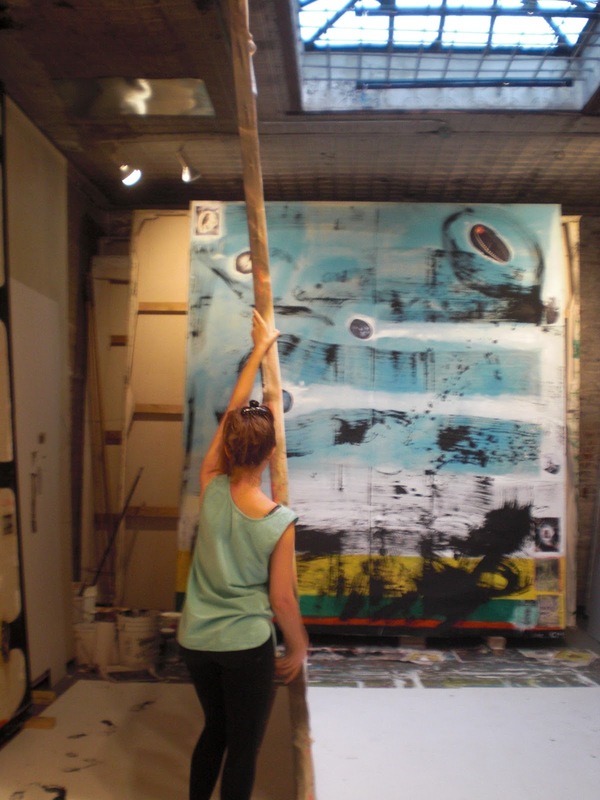 Along with Max, assistant Linnea Kniaz was hard at work building large stretchers, 135" x 118" in size, for canvases that Chris had worked on while upstate in the Catskills this past summer. There was a lot going on between the four of us, drills drilling, painters painting, pencils drawing. 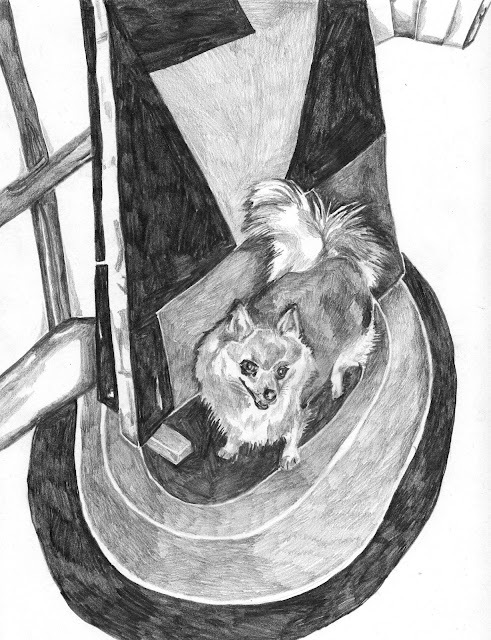 Not to forget tails wagging - much to my delight, Tamara Gonzales and Chris' Pomeranian also spent the day romping in and out of the space. Towards the back of the work room there is a moveable wall where Chris has put up images he will eventually use in his next installment of 280 + Cover. The first book in this series, the "Yellow Book," was sold at Koch Oberhuber Wolff in conjunction with a solo show in the Fall of 2010. He sent me home with a copy. Leafing through its sundry collection of photos, the book gave me an even deeper look into his practice, acting like a dialogue between his thoughts, his work and his everyday world: images consisting of his paintings, upside down trees, piles of junk, drawings, gnomes on rooftops, fluffy dogs on mountaintops, jam sessions, painted faces and cars, mushrooms, and award winning sheep. Chris' paintings and drawings already seem to come directly and generously from his life, calling on both his memory and immediate reality. Sometimes he does this by merely hinting at a landscape that he has experienced and physically attaching images or objects he has come across to the canvas. Or, in other ways, he might do this more explicitly by paying homage to the things that are influential or important to him, as he paints an artist's or musician's name across the bottom of his canvases. Chris explained to me that he painted on the soon to be stretched canvases while they laid in the grass behind his house upstate. You get the sense of how much his summer backyard had a hand in his process: the sky dropping water and shining a drying sun, the vibrant greenness and growth of the garden and grass giving an influence of color, footprints of animals and human's bare feet showing up scattered across the surface. In this instance, I see Chris playing two roles: part painter and part facilitator, collecting Summer's vitality by making these works a history of his days spent under the open sky of the Catskills. The three working walls in Chris' studio are covered with layers of paintings. I thought that eventually the whole space might close in on him like some trippy Twilight Zone episode -- the artist enveloped by his own artwork. 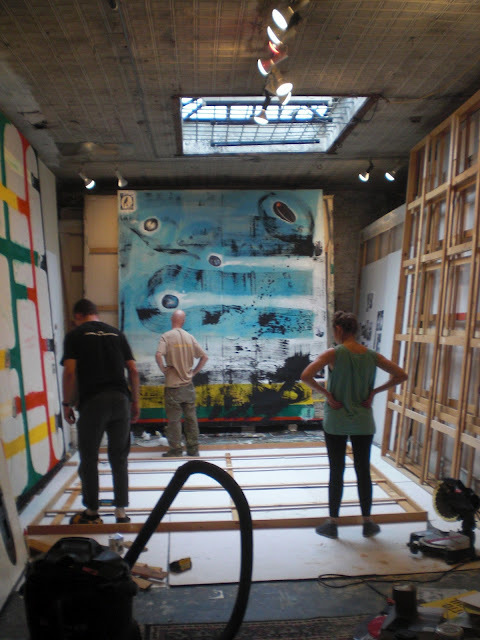 His incredibly large paintings tend to do this to the viewer on their own, enveloping us in their size and liveliness. Max and Linnea put together the massive stretchers throughout the day, having time towards the end to stretch a canvas on one. Propping it up against the wall, I imagined this to be the painting's vertical unveiling. Chris and I talked about our mutual love for drawing. 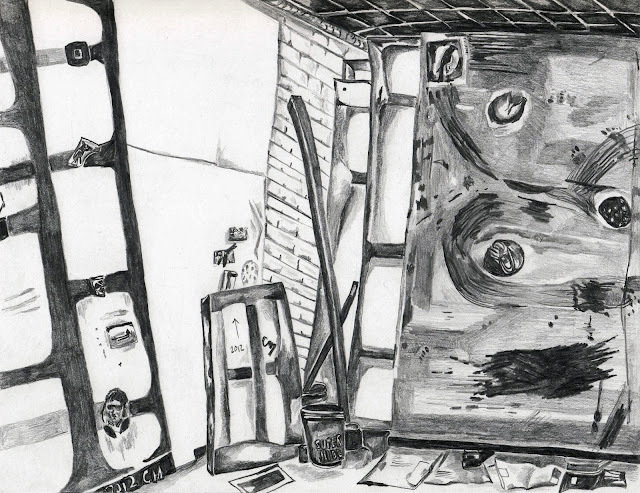 He told me that he had piles of stuff drawn on loose paper and showed me the shelves where he stored years of sketchbooks; he told me how his drawings often becomes the basis for his paintings. For me, spending the day drawing his new paintings, squinting to get the photo of Dylan pasted to the front of one of them to halfway resemble Dylan, while Chris closed out the studio day with some beats on his bongo drum, was an affirmation of why I love art. Check out more of Chris Martin's work at Mitchell-Innes & Nash.